One of the projects we have been writing about is a new blockchain project for trading bots – WolfpackBOT. Read an interview with their creator’s team. (CS) Can you give us your project description in a two – three sentences for those who doesn’t know your project yet? WolfpackBOT enables both beginners and advanced users with the ability to execute accurate trading algorithms, turning volatility into opportunity with compounding gains. Alongside WolfpackBOT, Wolfcoin is offered to users as a utility coin redeemable for WolfpackBOT subscriptions, the WolfBOX Console, WolfpackBOT and Wolfcoin apparel and merchandise. (CS) What is the main goal of your project, what is the use of WolfpackBOT coin? The goal of our project is to enable all users with the opportunity to trade like a pro while maximizing their potential gains through the use of our WolfpackBOT crypto trading bot and the Wolfcoin Masternode and Proof of Work X11 Blockchain. WolfpackBOT and the Wolfcoin ecosystem empowers all users with the tools necessary to achieve their goals in trading automation. (CS) Your short story – how did you come up with idea of this project? There are many trading bots but your team decided to create new – must be serious reason behind it. Our team of experienced traders were all motivated by the inferiority of existing trading bots and propelled to create our own. Some of our exclusive features include: Live Candle Scanning, Simultaneous Trading on Multiple Candle Sizes and All Trading Pairs, Trading Speed of <1ms, Customizable TA Scanning Speed, Free Pre-configured Strategies, and much more. (CS) What is the most unique thing about your project if you compare with similar projects that are in a market? 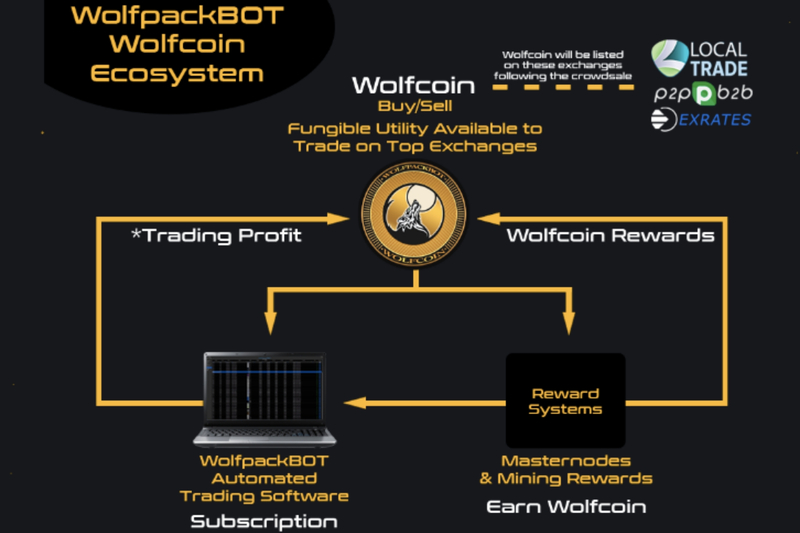 Not only does WolfpackBOT have Live Candle Scanning, Simultaneous Trading on Multiple Candle Sizes and All Trading Pairs, Trading Speed of <1ms, Customizable TA Scanning Speed, and Free Pre-configured Strategies, but also boasts the Wolfcoin ecosystem, with Masternodes and X11 Mining allowing users the option to alleviate future subscription costs by gaining Wolfcoin Rewards. (CS) Give us main benefits of the project in a few bullet points. (CS) Why do you think that your project will succeed and will be winner in a competition with other projects? WolfpackBOT has been designed with all crypto users in mind, new and experienced, and provides an excellent opportunity for anyone to trade like a pro! WolfpackBOT and the Wolfcoin Ecosystem give all crypto enthusiasts the opportunity to make every day a Wolf Market! (CS) What is guarantee of the stability of your project in a longer time period? Investors and users of coins are always very careful with choosing a new project to invest in. WolfpackBOT has the potential to utilize all market conditions optimally to the advantage of the user. Bear Market? Bull Market? With WolfpackBOT, every day is a Wolf Market! (CS) How did you meet your team members of the project? The WolfpackBOT team is built primarily of crypto trading enthusiasts who were not satisfied with existing trading bots. The majority of the team met through Crypto Hopper signals and settings groups. (CS) What future perspective of your project you see in 5 years? WolfpackBOT has the goal of maintaining the most advanced and leading edge crypto trading bot on the market utilizing innovative Machine Learning and AI technology. (CS) How to start to invest in your project if someone would like to do – what is the correct platform, way? Those interested may participate in the WolfpackBOT crowdsale at the website by registering and placing an order. What is the right place to get current news and trustable information about your project? Read our ARTICLE HERE about this project in details. Interview done on 6th of March, 2019.